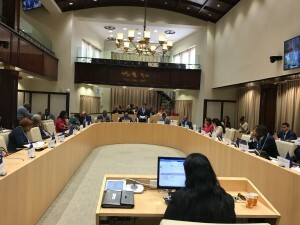 WILLEMSTAD - The Parliament of Curaçao on Tuesday discussed recent statements by the Central Bank of Curaçao and St. Maarten (CBCS) about the introduction of a Caribbean guilder. Opposition parties that had asked for the meeting questioned why money should be spent on a new currency when the existing Antillean guilder is still functioning well, despite the dismantling of the country Netherland Antilles per 10-10-10. MFK’s Gilmar Pisas asked if this should really be a priority in “chaotic times” for the monetary union. Yaël Plet of coalition party MAN asked why the eventual switch to Caribbean guilder had been included in the statues of CBCS. He asked if the Council of Ministers or Parliament should not have been consulted before the financial sector supervisor publicly stated its intentions and openly wondered about St. Maarten’s position. PAR’s Curtley Obispo said this was “old news” and wanted to know about the decision-making process. He queried the possible consequences, financing and duration of the operation. Finance Minister Kenneth Gijsberha (MAN) was still to answer the questions.